So basically chaos agent guide has 2 ways of blocking attacks, and now, this, black luster soldier - envoy of the beginning, giga ant brilli-ant and sea serpent leviair is now mandatory for decks using tour guide from the underworld. 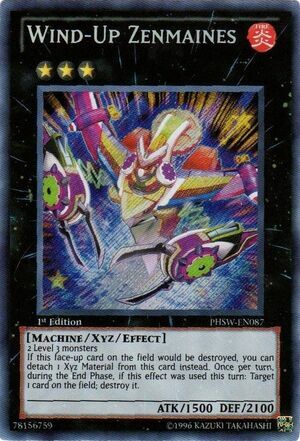 It's one of the 5 xyz's that I field in all my decks (utopia, roach, leviair, leviathan, zenmaines). Besides the tour-guide summoning Sangan and waiting for opponent to ram that sangan, tour-guide to zenmaines is the best opening moves (and one of the most annoying ones to opponents)you can pull off. I still laugh at people who open tour and summon leviathan; yes, a 2500 beater, but full with holes (no effect, 0 defense, can't direct attack once it lost it's 2nd material). Question is would i run it in a deck that doesn't run tour guide? I probably would try, but not 100% sure. I just ran a quick brain scan of my decks, and i realized that i have tour guide in all my decks. The tour is that good. Let's start the vote if it should be semi-limited or plainly limited next format. I am tired of seeing it in every single duel xD and when i say every duel..i mean every duel..
Well zenmaines IMO is a staple in any deck that runs tour guide Or goes rank3 xyz. Good staller + it's destruction effect is a great plus. With you opponent wasting resources well you build up your combos and defense , you have a great advantage over your opponent. This card, for me at least, is the new best Rank 3 Xyz. I tested someone today that was playing a Sacred deck, and he managed to get out 3 of these during the duel. Luckily, I was using Glad Beasts, and I had a Zenmaines of my own on the field, so I was safe. I still hate minusing myself for the sake for getting rid of it. The OCG is currently a control format, and cards like this are only slowing down our game even more. I don't mind that, though. Cyber Dragon + This into Chimeratech = umad bro? But in all seriousness, one of the best walls out there, really hard to kill without leaving yourself open, and when it's out of materials you can always hunter it. One of the better Rank 3 Exceeds out there, but it gets over-rated. I mean, how hard is it to not attack it before you're ready to dispose of it altogether? It's a friggin' defensive wall! It may be well for defense, but it still has its defaults, since you have to destroy a card in the end phase, and sometimes your opponent can play around it. ^^ Exactly, but opposing that, it is still useful when used properly, and everything is about timing.